Efren is currently a student at Bakersfield College and instructs the percussion section at Liberty High School. He also serves as the battery coordinator for the Golden Empire Drum & Bugle Corps. 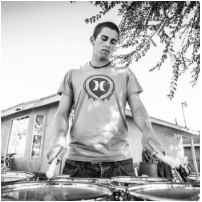 He has studied under some of the best educators and clinicians in the DCI and WGI activity. With such a diverse marching background, Efren brings a wealth of knowledge back home to the Bakersfield College program.